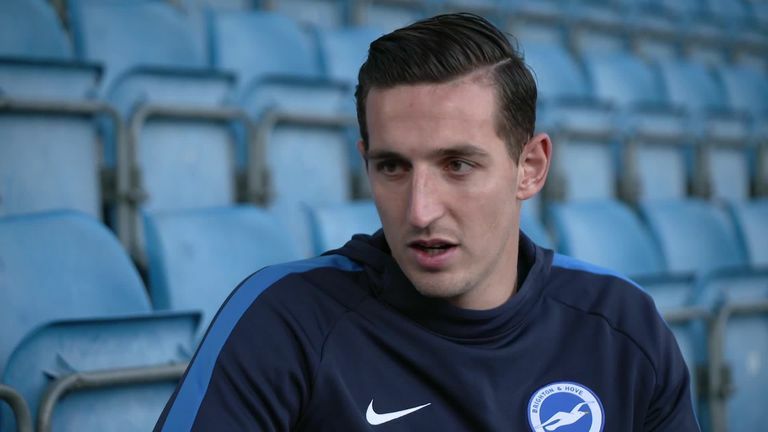 Ahead of Cardiff v Brighton, Lewis Dunk speaks about cold nights at The Withdean Stadium, where he played his first games for the club. Lewis Dunk is, by his own admission, living the dream. He's made his name with his hometown club at the highest level. And he's set to be capped by his country. Ahead of Brighton's trip to Cardiff, Sky Sports took the long-serving Brighton defender back to where it all began for him - in a rather different era for the south coast club. Prior to the construction of the Amex Stadium, the Withdean Stadium - a council-owned athletics facility on the outskirts of the city - was Brighton's makeshift home for 12 years. To accommodate league football, temporary, uncovered stands were erected around the outside of the track and the changing rooms were housed in portable buildings. "Most of my memories are with the youth team, watching games and sitting in the far corner on cold winter nights," he says, sitting in the one stand that still skirts the athletics track. "Teams didn't like coming here because of the changing rooms - but that's all we had. I spoke to boys that used to play against us. They said it was the worst place to come. "It's different for the boys coming through at our club now, they have lovely facilities. But, back then, we had hardly any. We used to have to do all the chores. It was a good grounding, a good start in football. It's probably helped me to get where I am today." In the late 1990s, the club was exiled by a previous owner's decision to sell the Goldstone Ground for retail development. Brighton and their fans fought a lengthy - and ultimately successful - campaign to persuade the planning authorities to allow them to build a new stadium at Falmer. A young Lewis Dunk took part. "I was more than happy to do so because I eventually wanted to play there like I am now," he says. "That was my dream - so I was out there marching on the seafront, singing `Falmer Yes!' and we got that amazing stadium." Dunk's breakthrough season in the first team in 2010/11 was the club's last at the Withdean. They left on a high by winning the League One title. "I did more of this that year!" he says, referring to the bench in the old dugout that he's sitting in at this moment. "But I played a few times and to be involved in a league-winning side that young and lifting the trophy on this pitch was a great experience. "I would have hoped it, I would have dreamed of it but, given where the club was at that time, I never thought that we would be - or I would be - where I am now." For Dunk, the sole survivor of Brighton's era in exile, it's already been a remarkable journey from the lower leagues to the Premier League. Now a first England cap beckons. He is in Gareth Southgate's squad for the forthcoming games against the USA and Croatia. "You make a lot of sacrifices as a young boy - not going out, not doing this and it makes it all worth it," he says. "Playing in the Premier League was one of my dreams and I made that one come true and now the next one's England so it'll make all the hard work worth it - especially for my old man who drove me all round the country. It'll make him the proudest father there is." Dunk's inclusion in the England squad comes on the back of a solid start by Brighton to their second Premier League season. Three successive 1-0 wins in October suggested a growing knowhow at this level. "I think that's our biggest strength - grinding games out when we have to," he says. "Every player will throw their body on the line to stop the ball going into the back of the net. If we get many more 1-0s, my job's done! "Last year was a massive learning curve. "In the first year you have the confidence of promotion and the second year, they say, is harder because you don't. But we're showing that we know what we're doing, that we belong here and we'll keep making sure we show that." Brighton have come a long way since the Withdean was the place that they called home. No one has relished the journey more than Dunk.